We had originally assumed the fanlight would be a Fypon composite. Fypon reproductions are based on real pieces, so we knew it would look OK. The only disconnect would be that the piece they copied would be generic, not specific to our entrance. However, the Fypon fan was really bigger than what had been there originally. It made the entrance too tall. Listening to my frustration, Jack suggested he build a smaller fan from scratch - same cost to the owners. Excellent! When the photograph of the entrance was blown up the shape of the fanlight could be seen as an arc with flat ends. Jack said this detail made it easier to assemble neatly to the sill ab ove the door. Good. 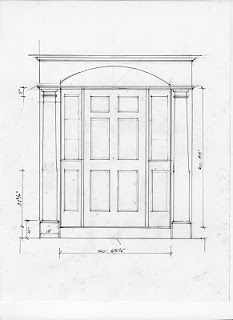 The circle which fit the arc of the fanlight, using the center of the door as its center, encompassed the whole entrance. The squares, the overlapping Golden Section rectangles were clean. The circle centered on the entrance is not quite as clear. I love the way it covers the entrance to the house, protecting it. But it's not crisp. Do I have it right?